Although this song comprises only three sentences and four fragments, the opening phrase was deceptively complicated. I had to consider several options: (1) the statement is a command in which an assumed "you" is instructed to love, with the verb being repeated for stylistic effect, (2) The Beatles have invented a new verb, to "love love" (which, I assume, implies a greater degree of intensity than simply to "love. "), or (3) a subject referred to as "love" is being instructed to "love." I decided that the latter, with "love" acting as subject and then verb, made for the simplest and most elegant diagram. While the grammar enthusiast in me found it difficult to leave the fragments predicateless, my goal isn't to correct Beatle grammar, so the "someone" (to love, like you) doesn't actually do anything, which--I assume--is precisely what Paul wanted. The greatest challenge posed by this song is the title phrase "P.S. I Love You." "Postscript" (the extended version of P.S.) is a noun, but Paul uses it almost as a conjunction, joining his promise to return soon with the final message "I love you." 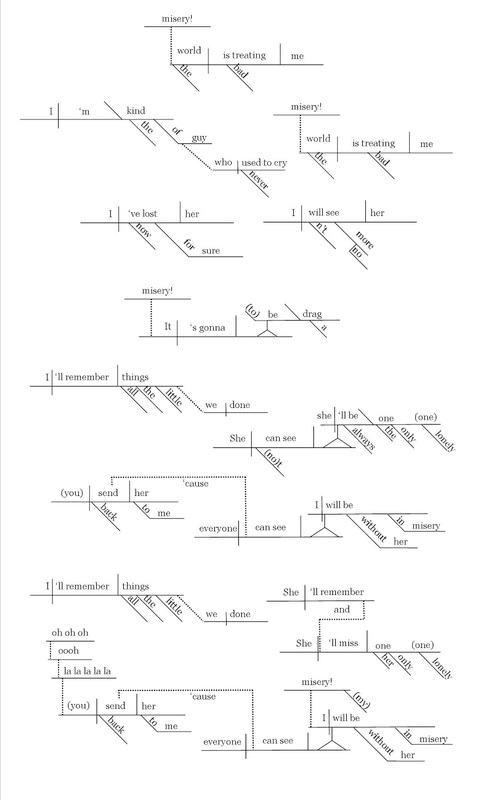 Although my goal here is to superimpose the Beatles' exact lyrics (correct grammar or otherwise) onto the sentence diagram structure, I felt that I could make this fit without taking too many liberties with either the grammar or the lyrics. In the end, I decided that an assumed linking verb was present: Paul states that the postscript is "I love you." A second challenge came from the additional vocals on the third repetition of the first verse. 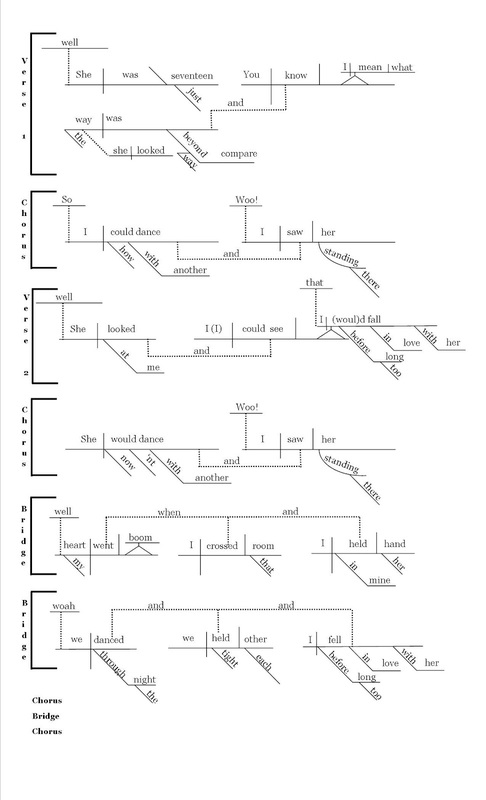 While most of these inserted lyrics function as interjections ("yeah," "oh!") 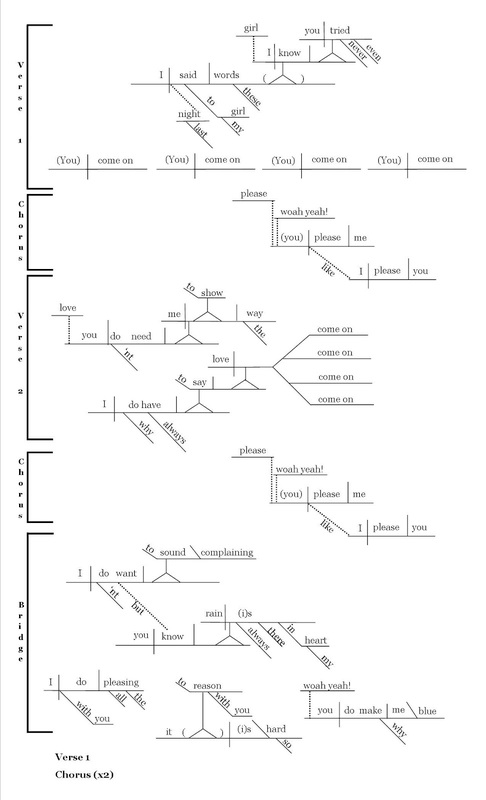 the phrase, "You know I want you to..." drastically changed the sentence structure, enough that I added a new diagram for the final recurrence. 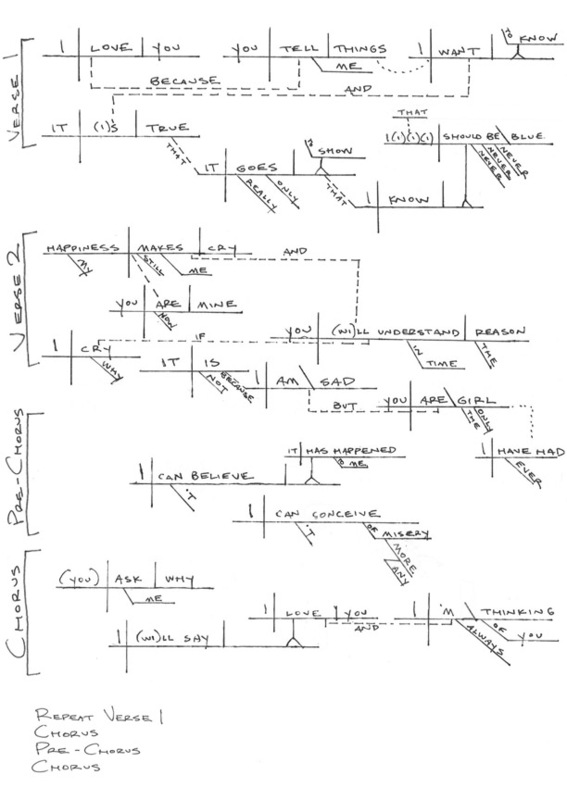 While it would have been easier to cut and paste or indicate another repetition, the opportunity to diagram a sentence that includes four pedestals made the extra work worthwhile. 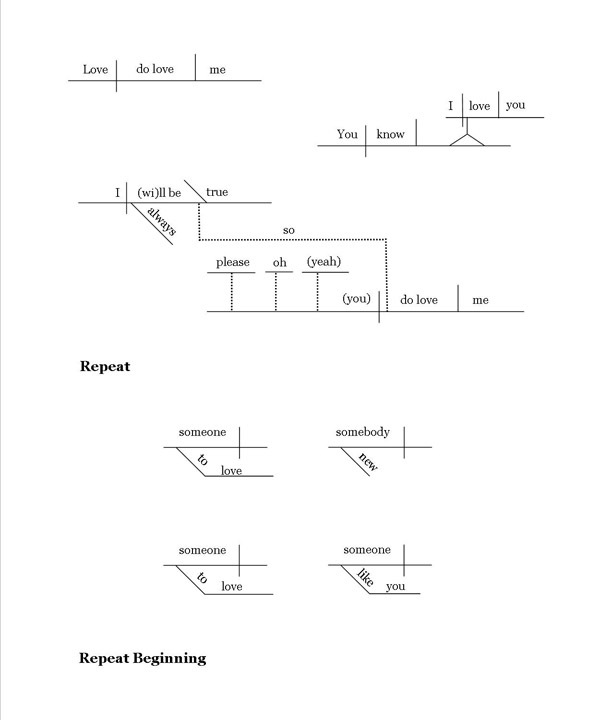 Welcome to "I diagram Beatles lyrics," a blog dedicated to two of my favorite preoccupations: grammar and the Beatles. 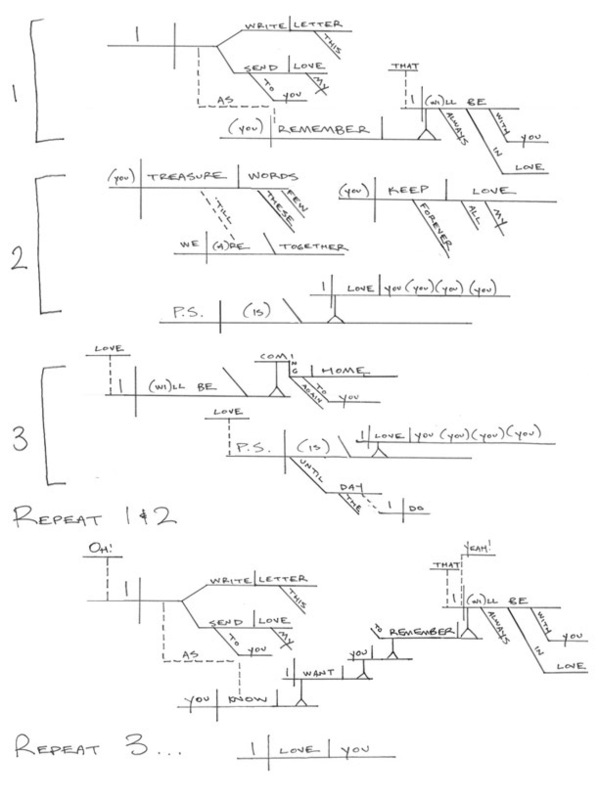 Using the traditional Reed-Kellogg diagramming system, I plan to work my way through the Beatles' discography, album by album, song by song. Feel free to comment or post if there's a song you're anxious to see. Or just let me know you're keeping up with or enjoying this massive waste of time.